This tiny orchid is difficult to spot, even when it occurs in colonies of many hundreds. As well as being one of the latest orchids to flower, this is also the smallest of the European orchids. 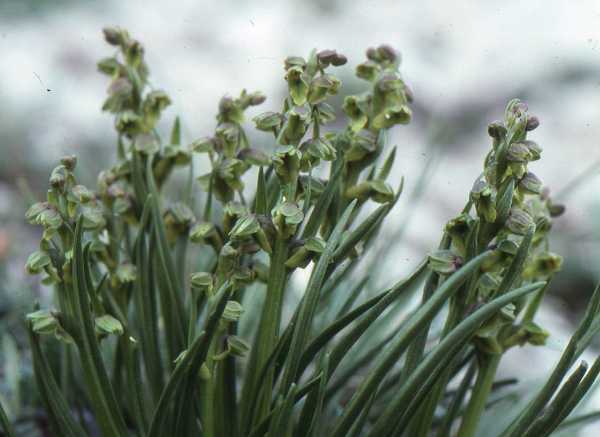 Only growing to a height of 10cm at the most, the green flowers are sometimes washed with brown - only adding to the problems with their visibility. They are not so dissimilar to the flowers of the Frog Orchid Dactylorhiza viridis. There are 4 to 10 narrow pointed basal leaves and small green bracts among the flowers. The ability to form large colonies is due to this plant's ability to spread via root tubers, but it is also pollinated by very small insects. Although occuring in some locations in large numbers, this orchid is very localised and rare. The picture on this page was taken in the Dolomites, in Italy. Chamorchis alpina grows in the mountains of Germany, Switzerland, Austria and France as well as in several other central and eastern European countries including Slovenia, Further north this orchid grows in Scandinavia, Finland, and in Russia its range extends far north as the Kola Peninsula. In more southerly parts of Europe Chamorchis alpina occurs high up above the mountain tree-lines - up to 2,700m above sea level. Further north in Scandinavia and Russia, for instance, it occurs at sea level. This plant grows in alkaline short-sward grasslands in open sunny positions. Chamorchis alpina flowers from the beginning of July to the end of August.